As mentioned earlier on this blog, Line Gordon and I are looking for a PhD student to be part of an international research project. The PhD position is at Stockholm University (Sweden) in Physical Geography, but the student will be based at both Physical Geography and the Stockholm Resilience Centre. The student will develop a conceptual framework and empirical methods to investigate how globally driven hydrological changes could alter the social-ecological resilience of Arctic ecosystems. This research includes reviewing evidence for possible hydrologically triggered abrupt threshold changes or regime shifts in Arctic ecosystems, the synthesis of existing social, ecological and physical data to map social-ecological resilience in the Arctic, and the construction of minimal social-ecological models of Arctic regime shifts. The proposed starting date is January 1, 2009 (although this can be negotiated). Applications will be taken until Oct 31th, 2008. The official job ad and details are here. The summer opening of the Arctic means that new uses of the Arctic are likely to emerge. International legal experts believe that “existing laws governing everything from fish stocks to bio-prospecting by pharmaceutical companies” are inadequate. To date, the eight Arctic nations (the United States, Russia, Canada, Norway, Sweden, Iceland, Denmark and Finland) have limited discussions to existing agreements, such as the law of the sea. Environmental groups would like new laws, but others have suggested a more feasible, and adaptive response may be to strengthen the role of the existing Arctic Council to better govern a changing Arctic in a more adaptive way. The shipping shortcuts of the Northern Sea Route (over Eurasia) and the Northwest Passage (over North America) would cut existing oceanic transit times by days, saving shipping companies — not to mention navies and smugglers — thousands of miles in travel. … Taking into account canal fees, fuel costs, and other variables that determine freight rates, these shortcuts could cut the cost of a single voyage by a large container ship by as much as 20 percent — from approximately $17.5 million to $14 million — saving the shipping industry billions of dollars a year. The savings would be even greater for the megaships that are unable to fit through the Panama and Suez Canals and so currently sail around the Cape of Good Hope and Cape Horn. Moreover, these Arctic routes would also allow commercial and military vessels to avoid sailing through politically unstable Middle Eastern waters and the pirate-infested South China Sea. An Iranian provocation in the Strait of Hormuz, such as the one that occurred in January, would be considered far less of a threat in an age of trans-Arctic shipping. Arctic shipping could also dramatically affect global trade patterns. … As soon as marine insurers recalculate the risks involved in these voyages, trans-Arctic shipping will become commercially viable and begin on a large scale. In an age of just-in-time delivery, and with increasing fuel costs eating into the profits of shipping companies, reducing long-haul sailing distances by as much as 40 percent could usher in a new phase of globalization. Arctic routes would force further competition between the Panama and Suez Canals, thereby reducing current canal tolls; shipping chokepoints such as the Strait of Malacca would no longer dictate global shipping patterns; and Arctic seaways would allow for greater international economic integration. When the ice recedes enough, likely within this decade, a marine highway directly over the North Pole will materialize. Such a route, which would most likely run between Iceland and Alaska’s Dutch Harbor, would connect shipping megaports in the North Atlantic with those in the North Pacific and radiate outward to other ports in a hub-and-spoke system. A fast lane is now under development between the Arctic port of Murmansk, in Russia, and the Hudson Bay port of Churchill, in Canada, which is connected to the North American rail network. Arctic sea ice: is it tipped yet? RealClimate reports from the AGU about Arctic sea ice: is it tipped yet? The summer of 2007 was apocalyptic for Arctic sea ice. The coverage and thickness of sea ice in the Arctic has been declining steadily over the past few decades, but this year the ice lost an area about the size of Texas, reaching its minimum on about the 16th of September. Arctic sea ice seems to me the best and more imminent example of a tipping point in the climate system. A series of talks aimed to explain the reason for the meltdown. The disappearance of the ice was set up by warming surface waters and loss of the thicker multi-year ice in favor of thinner single-year ice. But the collapse of ice coverage this year was also something of a random event. This change was much more abrupt than the averaged results of the multiple IPCC AR4 models, but if you look at individual model runs, you can find sudden decreases in ice cover such as this. In the particular model run which looks most like 2007, the ice subsequently recovered somewhat, although never regaining the coverage before the meltback event. Options A and B had significant audience support, while only one brave soul voted for the most conservative option C. No one remarked that the “skeptic” possibility, that Arctic sea ice is not melting back at all, was not even offered or asked for. Climate scientists have moved beyond that. For more coverage see Nature’s Great Beyond. 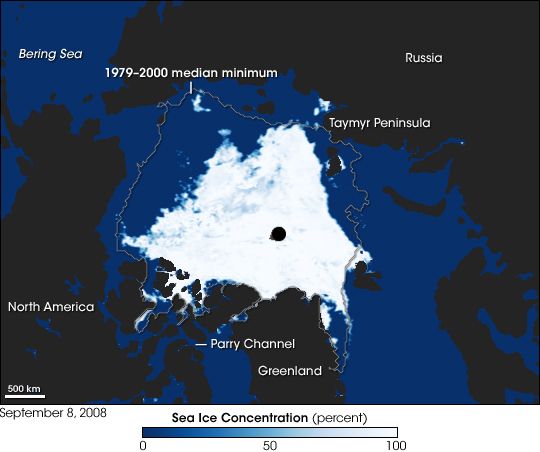 Arctic sea ice has reached record low coverage in 2007. This image shows the Arctic as observed by the Advanced Microwave Scanning Radiometer for EOS (AMSR-E) aboard NASA’s Aqua satellite on September 16, 2007. In this image, blue indicates open water, white indicates high sea ice concentration, and turquoise indicates loosely packed sea ice. The black circle at the North Pole results from an absence of data as the satellite does not make observations that far north. Three contour lines appear on this image. 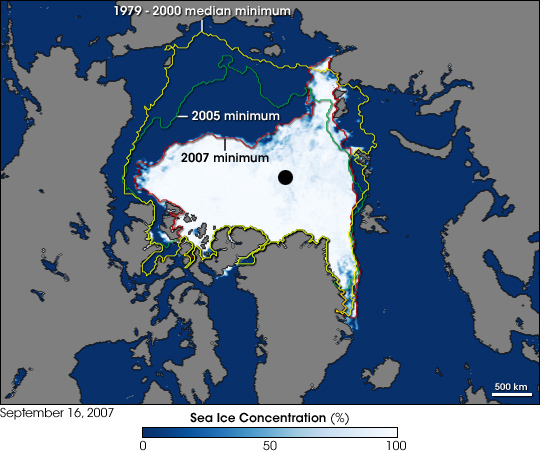 The red line is the 2007 minimum, as of September 15, and it almost exactly fits the sea ice observed by AMSR-E. Depending on the calculations, the minimum occurred on September 14 (one-day running average) or September 16 (five-day running average). 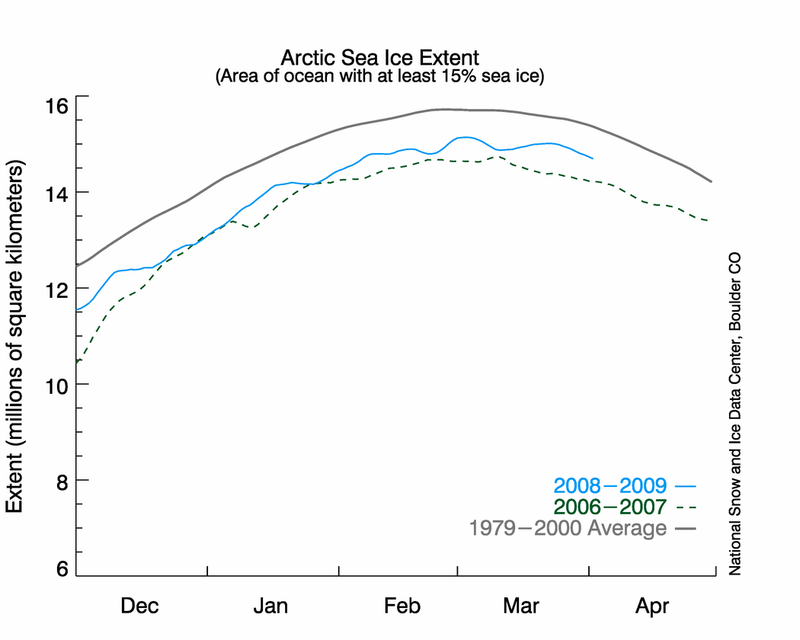 The green line indicates the 2005 minimum, the previous record low. The yellow line indicates the median minimum from 1979 to 2000. In 2005 on Resilience Science, Line Gordon, wrote about recent research that we may have already passed tipping points in the Arctic. NSIDC Arctic Sea Ice News Fall 2007 is providing weekly updates on the state of Arctic sea ice, which has reached record low coverage this year (the previous record low was in 2005). 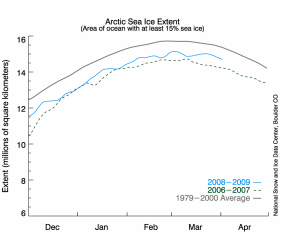 The figure shows daily ice extent for 2007, 2005 and to the 1979 to 2000 average. Is the Arctic Already Lost? Is the home of polar bears, seals and Inuit communities already doomed? asks Jon Foley in Tipping Points in the Tundra a recent commentary Science. According to him, several recent sources of evidence show that feedback mechanisms seem to be kicking into high gear as the Arctic warms up. 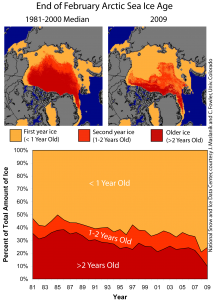 Temperature data illustrate, for example, that from the 1960’s to the 1980’s, the Arctic warmed by 0.15 degrees Celsius per decade, but since then the warming has been nearly 0.3 to 0.4 degrees per decade. Recent evidence comes from Terry Chapin and his co-workers who have analyzed Arctic data on surface temperature, cloud cover, energy exchange, albedo, and changes in snow cover and vegetation. They concluded that the recent changes in the length of the snow-free season have triggered a set of interlinked feedbacks that will amplify future rates of summer warming. One of these feedbacks relate to that the snowmelt has advanced by around 2.5 days per decade which has lead to an increase in the amount of energy that is absorbed and transferred to the atmosphere. The resulting regional increase in temperature is estimated to be comparable (per unit area) to the global atmospheric heating that is projected from a doubling of CO2 levels in the atmosphere. Chapin et al. also analyses the role of vegetation change for triggering positive feedbacks. Tall shrublands have increased rapidly in the surrounding region of the Arctic. Tree lines have also moved further north. Although the estimated contributions these have on warming were found to be small, the authors expect that they will continue to increase disproportionally in the future.